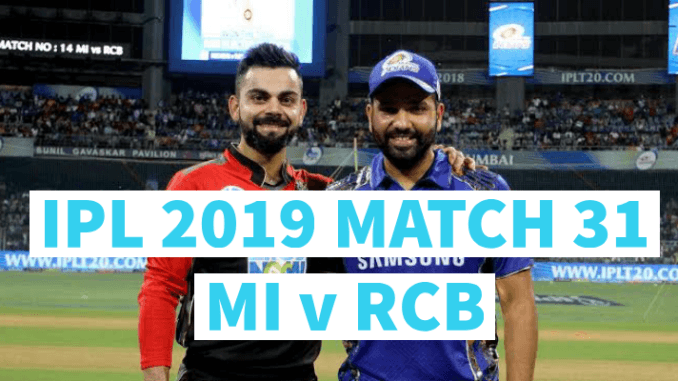 Mumbai Indians host Royal Challengers Bangalore in the 31st match of this IPL season. Mumbai enter the game after a loss to RR, while Challengers enter puffed up after their first win in Mohali. On other levels, it’ll be a game amongst Rohit Sharma and Virat Kohli, and their rivalry should shine bright on the pitch. Meanwhile, Mumbai have a few injuries to worry about while RCB would most likely go with the same squad. Rohit Sharma (C), Quinton de Kock, Evin Lewis, Ishan Kishan, Suryakumar Yadav, Siddhesh Lad, Krunal Pandya, Hardik Pandya, Kieron Pollard, Ben Cutting, Mayank Markande, Jasprit Bumrah, Barinder Sran, Rasikh Dar, Mitchell McClenaghan, Lasith Malinga, Jason Behrendorff, Anukul Roy, Anmolpreet Singh, Yuvraj Singh, Pankaj Jaiswal, Aditya Tare, Rahul Chahar, Alzarri Joseph, Adam Milne and Jayant Yadav. Possible Playing 11 : Rohit Sharma (c), Quinton de Kock (wk), Suryakumar Yadav, Ishan Kishan, Krunal Pandya, Kieron Pollard, Hardik Pandya, Rahul Chahar, Jason Behrendorff, Jasprit Bumrah and Lasith Malinga/Alzarri Joseph. Virat Kohli(C), Parthiv Patel, Devdutt Padikkal, AB de Villiers, Gurkeerat Singh, Akshdeep Nath, Shimron Hetmyer, Colin de Grandhomme, Shivam Dube, Himmat Singh, Milind Kumar, Marcus Stoinis, Moeen Ali, Pawan Negi, Washington Sundar, Prayas Ray Barman, Heinrich Klaasen, Yuzvendra Chahal, Umesh Yadav, Mohammed Siraj, Navdeep Saini, Kulwant Khejroliya, Tim Southee and Nathan Coulter-Nile. Possible Playing 11: Parthiv Patel (WK), Virat Kohli (C), AB de Villiers, Marcus Stoinis, Moeen Ali, Akshdeep Nath, Washington Sundar , Umesh Yadav, Navdeep Saini, Mohammed Siraj and Yuzvendra Chahal.